Grief is a universal human experience which every culture experiences and has its own methods of dealing with it. But abortion grief is unique since it is a pain which has no name and cannot be openly spoken about; yet it is deep and very painful. This pain is experienced when “mother love” is wounded. “Mother love” is a mysterious love written deep within the heart of a woman, deep within the essence of her feminine “I.” “Mother love” is the mysterious union between her “I” and the “I” of another, her child. This is a union which society and the abortive woman have not understood or anticipated; and they have found it cannot be suppressed. This grief which follows abortion is the truth of the very existence of “mother love” which ensures that no creation will pass by unnoticed. Many reasons are given for this grief but the most fundamental one is that a woman has written within her being a connection, a primordial attachment, to her infant, from its earliest moment of conception. This is because her body knows it has cooperated with God to bring to birth a new creation: “[M]otherhood involves a special communion with the mystery of life as it develops in the woman’s womb” (John Paul II, On the Dignity & Vocation of Women). This covenant is extended every time motherhood is repeated making the birth of each child a salvific moment for a woman. The moral awareness or “knowing” that to abort her child is wrong and harmful to both of them, and to humanity, is the intuitive knowing deeply written within a mother’s feminine dignity, “the dignity which is joined in the closest possible way to the vocation of every person” (John Paul II). Her child’s dignity is that of an authentic human being designed in the image and likeness of God. This is indelibly imprinted in a mother’s conscience, that private sanctuary where God has communed His desires to her. Abortion grief is the response to the death of one whose dignity, irrespective of gestational age, is the dignity accorded to it by God in His primordial design of the human species and continued with each new conception; a dignity which no one may violate without suffering. This grief is experienced by the essential “I” in recognition of the violence done against another “I” in a determined deliberate action. It is the law written on the human heart (Jer 31:31-33) which demands the grief; and it is right and just to do so. Authentic awareness of the deeper realities of the human being is strengthened when actions and experiences activate the primordial imprint, “do good and avoid evil”. These actions and experiences resonate with the innermost instructions written on the human heart (Jer 31:31-33) and lived out in a manner visible to all. Abortion does not resonate with these inner realities and indeed beckons evil where previously none existed. Grief and suffering following abortion need not be dismissed nor doubted but can be received as a gift of mercy from God because it ensures that the child created by Him will not be willed out of existence, but be remembered and loved for an earthly lifetime and into eternity. For its parents this grief can be the moment of metanoia, a change because of the mercy offered. Mercy and the healing of these wounds call into being a new and holier creation, woman, who has been ministered to by God Himself who willed in Jesus Christ to suffer and to die so that her sin could be forgiven. Indeed, through the suffering and repentance of the abortive woman (and man), united to the suffering of Jesus Christ, the misery of that primordial act in Eden (Genesis 3:1-34), now repeated in the abortion facility, is reversed and changed into a new option for God. 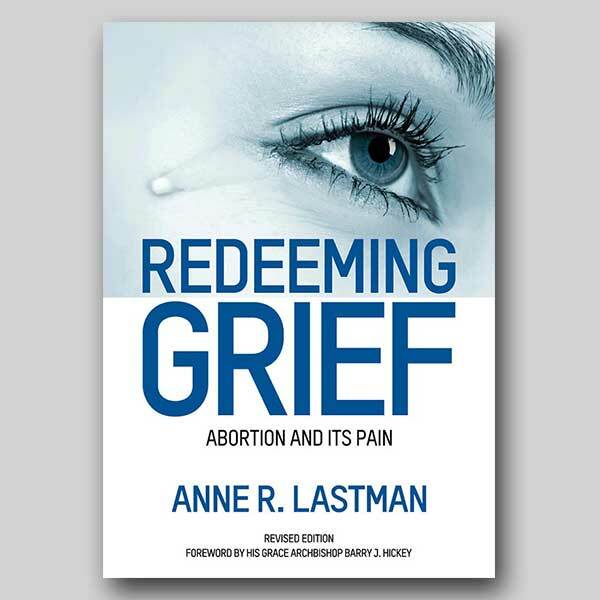 Abortion grief is a type of penitent suffering which is profound and experienced by the woman’s “I” as it travails to touch the other “I” which it has wounded. Yet within this type of suffering is hidden the key to the forgiveness offered by Jesus Christ. It is here where he meets, forgives and heals; here where he regathers to himself his own. The origin of suffering is not divine. However, the response to it is, and because this is so, the abortive woman who turns to God in an attitude of humility can be forgiven and shown Mercy Love, just as the memory of her baby cannot be forgotten because of “Mother Love.” The memory of the abortion remains as a salvific moment which deepens the understanding of the individual’s personal history, action and salvation. Indeed, Mercy Love and Mother Love equal the compassion of God.